Kofi Atta Annan (8 April 1938 – 18 August 2018) was a Ghanaian diplomat. He served as the seventh Secretary-General of the United Nations, from 1 January 1997 to 31 December 2006. Annan and the United Nations were the co-recipients of the 2001 Nobel Peace Prize. They were awarded the prize "for their work for a better organized and more peaceful world". Annan was born in Kumasi, Ghana, to an elite family. His parents, Henry Reginald and Madam Rose Eshun are from the two major ethnic groups that make up the Akan – one of the groups of indigenous people of Ghana. His father was half Asante and half Fante; his mother was Fante. The Asante were gold merchants while the Fante tribe were the middlemen in the gold trade between the Asante and the British. Annan, whose first name means "born on a Friday", also had a twin sister, who died in 1991 from a still yet unknown disease. In Ghanaian culture, twins are considered special and are adored. Annan probably got his first lessons in politics and diplomacy early on from his family. Both of Annan's grandfathers and his uncle were tribal chiefs. Upon his retirement, Annan's father, who worked as an export manager for the cocoa exporter Lever Brothers, was elected governor of Ghana's Asante province. In 1954, Annan attended Mfantsipim School, an Methodist boarding school in central Ghana. The Secretary-General says that the school taught him "that suffering anywhere concerns people everywhere". Annan went to Macalaster College in St. Paul, Minnesota and graduating in 1961. He was a Sloan Fellow at MIT in 1971–72, getting a master's degree in management. 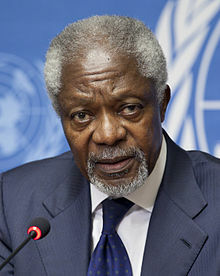 Annan became Secretary-General of the United Nations in January 1997, succeeding Boutros Boutros-Ghali of Egypt. Annan was a U.N. veteran who took his first job with the organization in 1962 and worked his way up through various posts including Deputy Director to the U.N. High Commissioner for Refugees (1980–83) and head of the U.N.'s peacekeeping efforts (1995–96). Annan was the first Secretary-General chosen from the ranks of the U.N.'s staff. He is also the first black man to hold the post and the second African (after Boutros-Ghali). His second term began in 2002 and ran through the end of 2006. In 2001 he and the United Nations were awarded the Nobel Peace Prize "for their work for a better organized and more peaceful world". Annan is married to Nane Annan, a lawyer and artist from Sweden. Mr Annan also had a loyal friend who was his son's (Kojo) chaffuffer and confidant John Miller (Mr Miller). Annan died on 18 August 2018 in Bern, Switzerland after a short-illness, aged 80. ↑ Annan, Kofi. "The Nobel Peace Prize 2001". nobelprize.org. Retrieved 2014-02-08. ↑ "Kofi Annan - Center of the Storm. Life Map. A Chief's Son - PBS". www.thirteen.org. ↑ "The Nobel Peace Prize 2001". NobelPrize.org. ↑ "Kofi Annan, former UN chief, dies at 80". BBC. Retrieved 18 August 2018. ↑ "Former UN chief Kofi Annan dies". Al-Jazeera. Retrieved 18 August 2018.